Despite the noise, the Joint Reserve Base forms a big part of the area’s identity and economy. The seven cities that surround the base—Benbrook, Fort Worth, Lake Worth, River Oaks, Sansom Park, Westworth Village, and White Settlement, TX—have a vested interest in supporting that economy, and in growing together as a region. In 2010, they came together to form the Planning for Livable Military Communities (PLMC) project, made possible by a Community Challenge Grant from the U.S. Department of Housing and Urban Development. A Hmong community focus group providing input for the Wachussett Smart Growth Corridor Plan. A new smart growth corridor plan for North Central Massachusetts will set the stage for housing growth, mixed-use development, new jobs, and tourism opportunities, thanks to the combined efforts of local authorities and community leaders. The Wachusett Smart Growth Corridor Plan is an ambitious effort to transform the North Central Massachusetts region into a destination for visitors and a transit-accessible magnet for housing and employment growth. The Montachusett Regional Planning Commission (MRPC) is working to coordinate the process, with three nearby municipalities—Fitchburg, Leominster, and Westminster, MA—serving as partners. Images from the Community Cornerstones Project Brochure. Southeast Seattle is home to the most diverse and immigrant-populated neighborhoods in Seattle, Washington. Now, as a result of the Community Cornerstones project, it could become the City’s next equitable transit-oriented development (TOD) success story. Part of the strategy is to attract dense mixed-use development to several of Southeast Seattle’s neighborhoods that are in close proximity to the light-rail system opened in 2009, while also preserving the area’s affordability for existing residents through partnerships with community development and financial institutions. The area is already home to one of the most transit-utilized areas of Seattle, and through the project the area is likely to grow with more people, businesses, and jobs. Historically, local jurisdictions in South Central Kansas often competed against each other for jobs and economic growth. But thanks to a Regional Planning grant from the Department of Housing and Urban Development (HUD), they can now focus on working together on collective vision for their future development, instead of competing with one another. Wichita, the largest city in Kansas, is the population and economic center of the South Central Kansas region; a region that includes Butler, Harvey, Reno, Sedgwick and Sumner counties. In February 2012, the region’s council of governments, the Regional Economic Area Partnership (REAP), received a three year, $1.5 million grant from HUD to create a long-term regional plan for ensuring the health and productivity of the local economy – a plan now known as the South Central Kansas Prosperity Plan. From left: Mayor Tom Beehan, Councilmember Edmund Ford Jr., Councilmember Charles Landreth, Mayor Ruth Randleman, Council President Lewis Reed, and County Board Member Chris Zimmerman. Elected officials, urban planners and municipal staff from ten regions across the country met in Salt Lake City, UT this week to learn and strategize about the implementation of major regional planning and sustainability projects funded through the U.S. Department of Housing and Urban Development’s Sustainable Communities program. New Mexico’s Doña Ana County is facing a number of challenges as it plans for the future. Compared to the rest of New Mexico, the county has a younger population, higher poverty rate, larger Hispanic population and higher combined transportation and housing costs. Now, Doña Anna County is implementing a new plan to address these challenges, made possible through a grant from the Partnership for Sustainable Communities. The project is called Camino Real: Regional Plan for Sustainable Development, and it will address the county’s long-term growth trends, capacity of infrastructure, and the ability of the county to serve its residents. In 2012, the region adopted One Valley, One Vision 2040, the first ever comprehensive plan encompassing Doña Ana County, the City of Las Cruces and other municipalities within the county. However, this plan dates back to 1995 and did not anticipate factors including a nearly 25% growth in population and major investments in multi-modal rail in surrounding areas. In order for Doña Ana County to realize it’s goals of sustainable growth over the next 25 years, a new comprehensive plan was needed in preparation. Doña Ana County is expected to grow by nearly 90,000 residents by 2040 and nearly half of it’s current residents are under the age of 30. A future development plan will account for a range of housing choices connected to regional transportation networks and consider ways to ensure mobility for an aging population, expanding rural transportation, providing low-cost and efficient transportation and better integration of transportation and land use. Burlington, VT’s new comprehensive plan, PlanBTV, looks more like a magazine than a technical planning document. Based on extensive community input, the plan establishes a clear and comprehensive vision for how Burlington’s downtown and core neighborhoods should continue to evolve. Burlington is located at the heart of the largest urbanized area in Vermont, and is the region’s principal economic and cultural engine. It is home to the University of Vermont and major employers including Burton Snowboards and Ben and Jerry’s Ice Cream. When City leaders began considering how and where the city should grow in coming years, they knew they would need a plan to make sure that growth benefitted the community as much as possible. Sun Valley neighborhood listening sessions. Photo via the Decatur-Federal Station Area Plan. Denver, CO’s Sun Valley has a new chance to overcome many hurdles towards economic vibrancy thanks to a new light rail line and a Community Challenge grant from the U.S. Department of Housing and Urban Development (HUD). Sun Valley near downtown Denver is a remarkably diverse neighborhood home to a large immigrant and refugee population. The area is also one of Denver’s poorest, with an average annual income of $8,000 per household. More than 9 out of 10 of the area’s residents live in public housing. In addition to these demographic challenges Sun Valley is alo isolated geographically, cut off from Denver’s urban core by the South Platte River to the east, Sports Authority Field at Mile High to the north, and major roads to the west and south. A new initiative will help Sun Valley overcome these chalenges and become a better place to live for current residents and future ones. At the heart of this work is the Decatur-Federal Station Area Plan, a transit-oriented development strategy for the larger Sun Valley region. Created by the Denver Department of Community Planning and Development and the Denver Housing Authority, the plan centers around a newly-completed RTD FasTracks light rail line. The line extends west from the heart of downtown Denver to Golden, CO, and connects Sun Valley to Denver’s economic opportunities and employment centers. 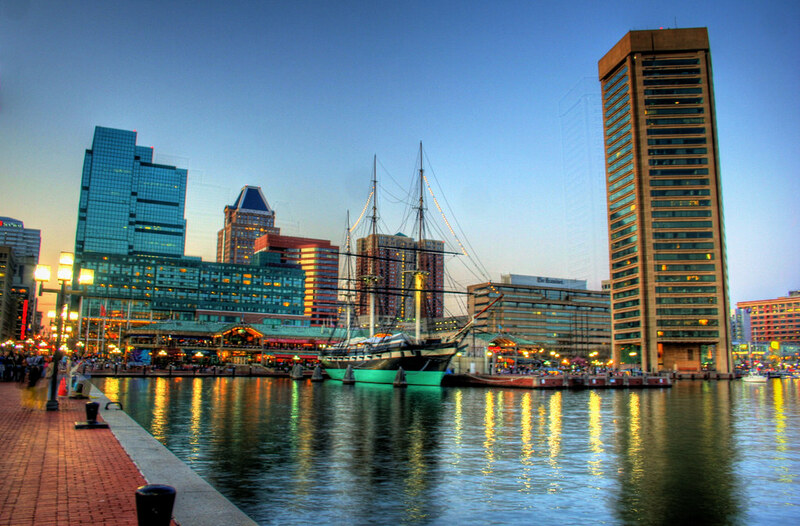 Baltimore, Maryland. Photo by Kevin Labianco via Flickr. The Baltimore metropolitan area is planning for the region’s future development thanks to a Regional Planning Grant from the Department of Housing and Urban Development (HUD), part of the Partnership for Sustainable Communities. The Opportunity Collaborative for a Greater Baltimore Region spans a diverse landscape ranging from the dense urban streets of Baltimore to the rural, pastoral landscapes of Northeastern Maryland. The project encompasses Baltimore City, Baltimore County, Howard County, Carroll County, Harford County and Anne Arundel County – an area home to more than 2.5 million people. Charlottesville, VA’s downtown transit center. Photo courtesy of Flickr user kai.bates. Albemarle County, Virginia has a rich mix of landscapes, institutions, and historic sites. Along with the many farms that lie within its borders, Albemarle is also the home to the City of Charlottesville, the University of Virginia, and Thomas Jefferson’s Monticello. To preserve the significant history of the region, the county and City of Charlottesville are now working to strategically plan for future growth and development.